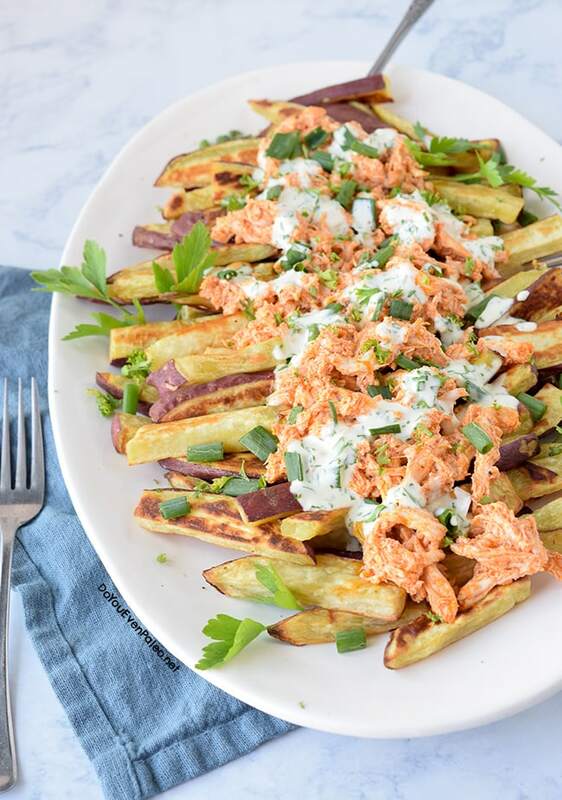 I feel like I’m on to something with these buffalo chicken smothered sweet potato fries. Smothered fries are like a superior nacho. There, I said it. Sure, you have to use a fork for smothered fries, but that’s hardly any reason to pass them up. 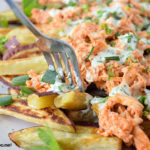 The spiciness of basic buffalo chicken is evened out by the slight sweetness of oriental sweet potato fries and a simple cilantro mayo sauce. <– That sentence alone sums up how simplistic this recipe can be. 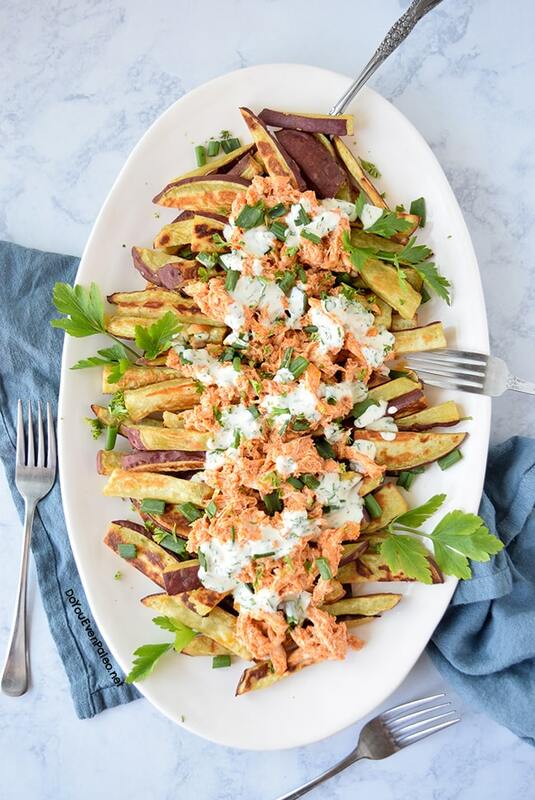 Just smother some sweet potato fries in flavorful meat and add a couple toppings. If you’re reading this, you’re probably wondering to yourself how you could have missed the supreme awesomeness of smothered fries. Well, you won’t be missing it anymore. Grab a fork—you’re going to want to dig in. I’ll admit, I already have new ideas for smothered sweet potato fries bumping around in my head. Breakfast smothered fries. Carne asada fries reminiscent of the hot mess I grew fond of in San Diego. Between smothered sweet potato fries recipes and ice cream recipes, I think we’ll have a very delicious summer ahead of us on this blog. After spreading these on a platter for photographing, I know they would make an awesome addition for an intimate party (the kind where no one minds sharing a plate). Double the recipe, serve it up spread across a platter like in the pictures, and provide lots of forks and napkins. Your guests will be happy and you’ll be happy with only one dish to clean up. I’m a genius, right? Dinner party brilliance right here. If I ever actually hosted dinner parties, I’d know if that was actually a good tactic. Okay, the point is: this is an awesome recipe to share with friends and family OR you could roll like me and just hoard it all for yourself. Quick tip! Need shredded chicken just for this recipe? Use my Dutch Oven Shredded Chicken. 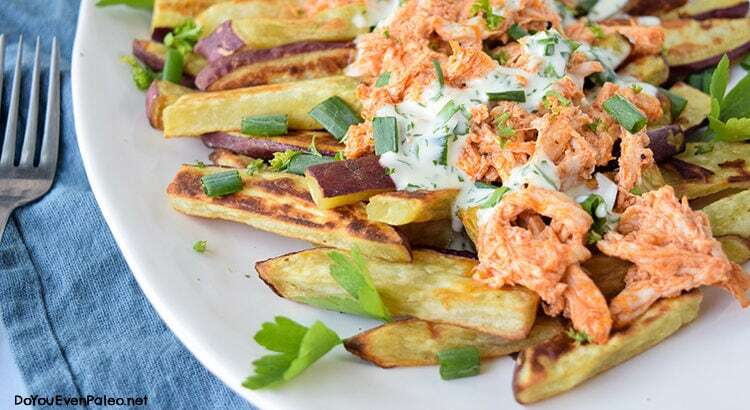 A platter of these buffalo chicken smothered sweet potato fries make an excellent meal to split with friends…or to keep all to yourself. Toss sweet potato fries in avocado oil and salt. Place all fries on baking sheet, making sure none are touching. Bake for 20 minutes, then flip and bake for an additional 15 minutes. Meanwhile, combine the hot sauce and ghee in a small saucepot. Heat over medium heat until ghee has melted. Stir until completely combined. Add the shredded chicken and stir until chicken is completely covered in sauce. Remove from heat. Prepare the cilantro mayo by combining minced cilantro, mayo, lime juice, and water. Add more water as necessary for your desired consistency. Once the fries are done cooking and have cooled for a few minutes, build the loaded fries. 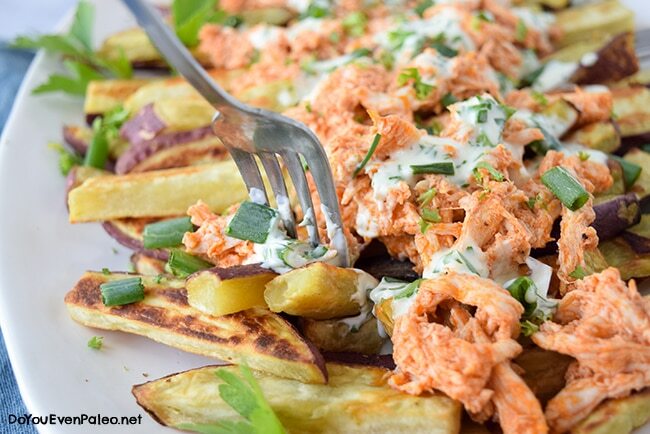 Spread fries on a platter and top with buffalo chicken. Drizzle on the cilantro mayo sauce, then sprinkle with parsley and green onions. OMG!! This was PERFECT. …and so simple. I absolutely love Buffalo Chicken so this was a no brainier for me to want to make. Didn’t have any potatoes do I used yuca. Yum-dilly-perfect!? 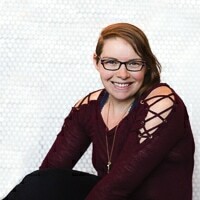 So glad to hear it, AnnMarie! I’ve been dying to try yucca (I hear it makes awesome fries) but I can’t find it where I live. Thanks for trying the recipe and commenting. I really appreciate it! That is wicked cool! I’ll have to check the freezer section when I go grocery shopping this weekend. I never thought to look there. Thank you so much for the tip! I’ve been going back and forth between Paleo and Whole30 for about six months and like to keep my recipe rotation exciting. I stumbled across your site and made this dish the other night. OMG! This is hands down the best meal I’ve made. (I used your Dutch oven shredded chicken recipe for the chicken. )Even my non-Paleo significant other loved them. Delicious! Next up are the Pork Belly Benedict Smothered Fries. I can’t wait! Don't subscribe All Replies to my comments Notify me of followup comments via e-mail. 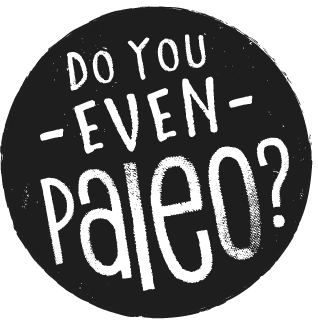 You can also <a href='https://www.doyouevenpaleo.net/comment-subscriptions/?srp=1549&srk=87505361eee98908ddf6ccb8681f50d6&sra=s&srsrc=f'>subscribe</a> without commenting.